Star Wars was unlike anything seen before. It marked the beginning of epic, blockbuster movies and featured special effects that changed the industry forever. For me, it marked the beginning of what is an ongoing infatuation with virtual men in body armor. I think that a big part of the infatuation is the aura of mystery projected by the character – you don’t see the man inside the armor; the only glimpses of him come through his voice and actions. 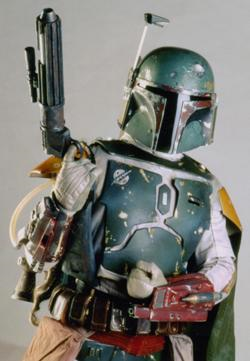 I was actually very disappointed when Boba Fett was given a face in “Episode II: Attack of the Clones.” He will always be awesome, but I preferred it when he could look any way that I wanted him to. Bungie LLC – the original creators of Halo – understood the mystique of the man inside the armor; they swore that the Chief would never be seen without his helmet/armor. I can only hope that 343 Industries, now the carriers of the Halo torch, keep this promise as well. Do you have any virtual crushes from movies or videos games? If so, please share in the comments. It will be our secret, I promise. This entry was posted in Games/Movies/TV and tagged 343 Industries, Boba Fett, body armor, Bungie, Halo, infatuation, Master Chief, Star Wars. The webpage is up! Looking good. Hi Sara! Thanks for stopping by. I’ve never played Metal Gear Solid so I don’t know much about Snake. (One of my sons is a diehard MGS fan though.) I would check him out, but I’m an XBOX girl. I secretly lusted after Darth Vader until in the Empire Strikes back they took his helmet off. So, I know how you feel. Excellent blog and congrats on it’s launch!! Thanks Teresa! For some reason, the bad guys are always super cool looking. I don’t know about you, but I think a cape always increases the “cool” factor. Those are some good points : ) Masked characters always drive me crazy too. I didn’t like that Boba Fett’s face was shown in II either. I would have preferred him to stay mysterious.